OK , OK. I admit that I am not really sure that Paul Samuelson, who died yesterday at age 94, ever wrote anything about the economics of wine (except when he was analyzing Ricardo’s wine-for-wool comparative advantage story, of course). But he sure wrote about everything else, as his full-page obituary in today’s New York Times makes clear. His influence infiltrated nearly every nook and cranny of contemporary economics so it is surely not wrong to say that he influenced wine economics, too. I only met Samuelson once (at a party at George Horowitz’s house) but he influenced me and my work in many ways. I especially appreciated his wit. I have a copy of the 1948 first edition of his famous economics textbook and it always pleases me to note that when he draws the diagram for guns versus butter, he actually uses pictures of field artillery and tiny cubes of butter to make his abstract point concrete. Most of all, however, I remember Samuelson for his bold focus on economic dynamics, which I discussed in the chapter seven of my 1998 book Selling Globalization. Samuelson saw economics as the study of change and the possibility of instability, not just static equilibrium (see the section called “unstable foundations” in the middle of the chapter). The idea is that agricultural markets aren’t always stable in the way we usually think about stability. They can be subject to various kinds of cycles and price surprises. Here’s how it works. In normal markets, producers look at today’s price and decide how much to supply today. This often isn’t possible in agricultural markets because the supply decision was made in the past (when the crop was planted) based upon price information and expectations then. The result of this delayed grower response to today’s market information is that price seldom quickly settles into a comfortable equilibrium the way the textbooks teach. Sometimes (as in the graph in the photo) price rises this year (encouraging growers to plant) and then falls next year (when the extra output hits the market, causing growers to cut back the next year) and then rises a little less the year after that (as the smaller crop pushes prices up again and makes growers optimistically increase plantings once again) and then falls a little less the year after that (due to the unintended surplus) and slowly converges on equilibrium by surrounding it (creating the cob-web shown here). Once at equilibrium, price holds steady until something inevitably shakes things up and starts the cob-web process again. Winegrowers are certainly familiar with the market cob-web although theirs is more complicated because it takes longer for newly planted vines to bear marketable fruit. Even though the market may be stable in the theoretical long run, prices can fluctuate wildly in the short term, raising all sorts of havoc in the process. Worse than this, however, is a second sort of cob-web (created by sometimes small differences in the slopes of the demand and supply curves) that causes the price swings to grow larger and larger instead of converging until the market finally collapses in crisis. Anyone who studies the history of commercial wine growing understands that this sort of cob-web is more than a theoretical possibility! 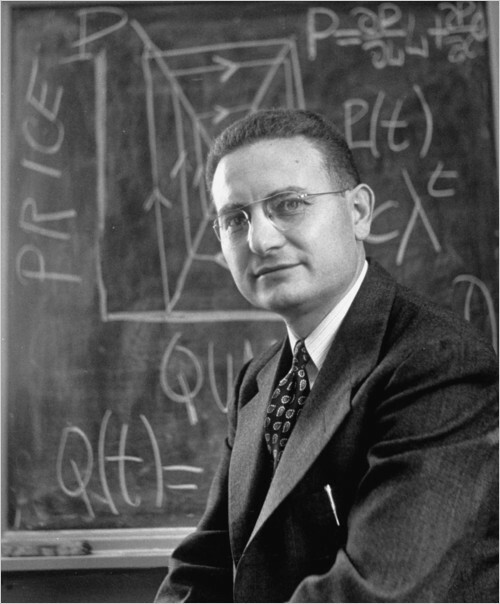 Raise a glass and toast the life and work of a great economist, Paul Samuelson. « Do Advertised Wines Get Higher Ratings?